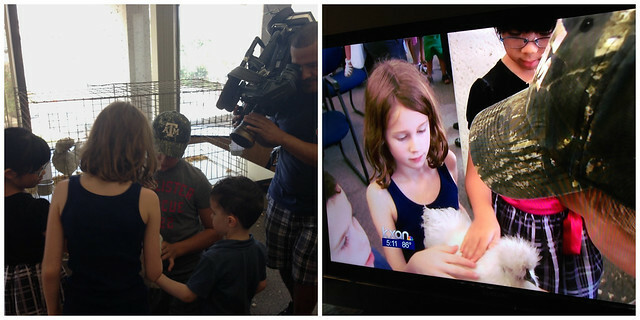 Our kids have been filmed for a KXAN report twice in the past month! September 8th they were downtown at an event called “Chickens in the Library” and got caught petting this sweet little silkie. Ben took the pictures with his phone. The right side is a picture of the T.V. while it was being aired. We organized our evening around trying to catch the news later that day. 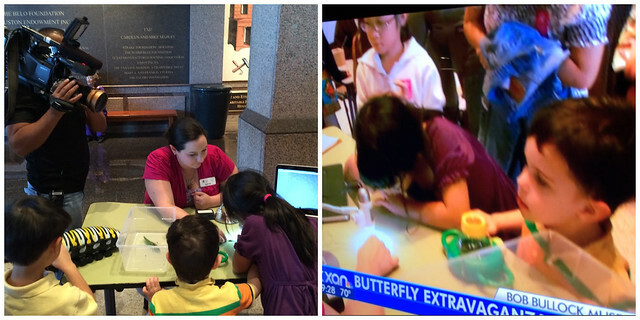 The kids saw themselves and were SO excited to be on T.V. Yesterday they were checking out monarch caterpillars at the Bullock Texas State History Museum while the same camera man swung by for a clip. This time we barely remembered to watch the newscast. The kids kind of shrugged their shoulders about being on T.V. Much less enthusiasm. I think it’s pretty remarkable of all the kids he could have filmed he got ours both times. Alright!!! I remember when Alva Middle had to go to bottled water instead of using the water fountain and I had my crappy, peeling nail polished hands on local t.v….So cool that the kids had their faces on tv!